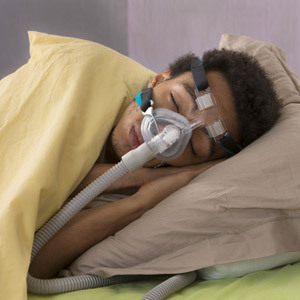 Leading sleep doctors are warning that patients are being incorrectly diagnosed with sleep apnoea by companies selling CPAP (continuous positive airway pressure) machines to treat the condition. The Federal Department of Health is investigating an apparent blowout in Medicare claims for home-based sleep tests for obstructive sleep apnoea (OSA). Department officials have also flagged concerns that some companies in Australia are administering the tests, offering a diagnosis and then profiting from selling CPAP machines, which cost about $2000. In May, the health department met with the Australasian Sleep Association alarmed that 75% of the home-based tests completed under Medicare were not ordered in conjunction with an assessment by a respiratory or sleep physician. Dr Jeremy Goldin, head of sleep medicine at Royal Melbourne Hospital, says he sees one patient a week who has been incorrectly diagnosed with obstructive sleep apnoea after undergoing a commercially performed sleep study. Professor Christine Jenkins, a thoracic physician at Sydney's Concord Hospital, shares Dr Goldin's concerns. She says she has seen patients complaining that the CPAP machine they had bought to treat the OSA they had been diagnosed with through a commercial sleep study was not relieving their symptoms. Upon investigation, it turned out these patients did not have obstructive sleep apnoea but more serious conditions, Professor Jenkins says. Last month, the Australasian Sleep Association wrote to its members stressing guidelines stipulating that companies selling CPAP machines should not provide diagnostics. Australian Doctor. 2015. Be awake to sleep apnoea misdiagnoses warn experts.